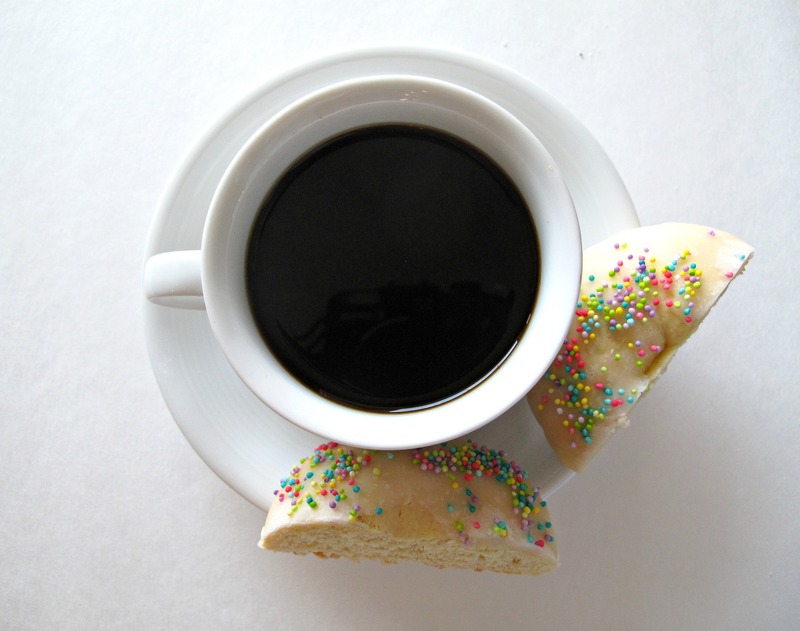 In my opinion, Italy is the home of the best coffee and the best cookies for munching and dunking along with that coffee. 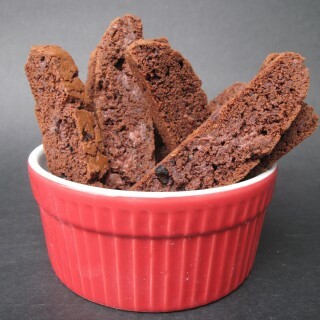 The Italian dunking cookie most familiar to Americans is biscotti, a true wonder of crunchy delight and a fabulous care package cookie. Another, perhaps less well known, Italian cookie designed to withstand the rigors of beverage dipping is the Taralli, which comes in many forms both savory and sweet. 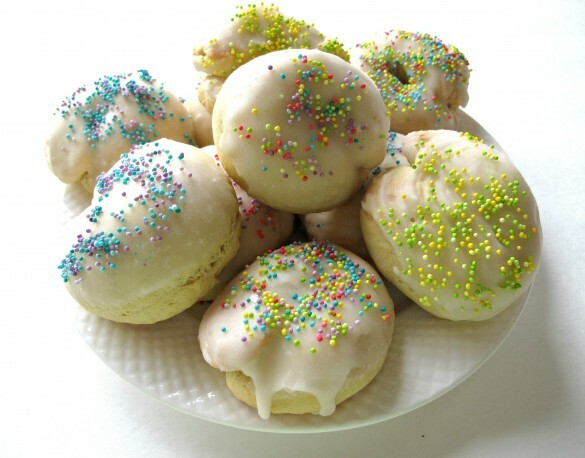 Taralli Dolce Di Pasqua are Italian Easter cookies, lightly sweet with a crunchy sugar icing flavored with citrus. I have been to Italy twice; once as a child and once as an adult. When I was twelve and thirteen, my family lived in Europe. In the summer, we hitched a travel trailer to the back of our VW minibus and traveled all over Europe, stopping at camp grounds along the way. I have vivid memories of traipsing through site after site of Roman ruins in blistering Italian summer heat and the cooling relief of dimly lit churches painted with Renaissance frescos. However, I have no memory from that trip of Italian food or drink other than an occasional gelato. My Italian trip as an adult was a week in Rome with my then 16 year old son. Vast amounts of research was done before that trip to pin point every award winning gelateria and pizzeria in Rome. I dreamed of sipping espresso from one end of Rome to the other. With a map in hand we planned to visit archeological sites and museums on our way to and from our culinary destinations. Now comes the pathetic part of my tale. Right before we boarded the plane for our 10 hour flight, I began to feel nauseous. Maybe something I ate at the airport? I popped a few Pepto pills and hoped for the best. Unfortunately, somewhere over the Atlantic it became obvious that the Pepto wasn’t helping. I just felt more and more nauseous and weak. I have never been sick while traveling before (or since, thank goodness) and there I was alone with my teenage son feeling so suddenly sick that I needed a wheelchair to get off the plane! The good news is that an English speaking doctor came to our hotel and gave me an Italian wonder drug. The nausea disappeared, but I was warned to eat very lightly. I was immensely glad to feel up to our anticipated adventure, even if I wasn’t able to eat or drink as planned. I was in the land of espresso, pasta, pizza, and gelato consuming tea and toast. I will just have to hope that the coin I threw in the Trevi Fountain will ensure a return trip to Rome someday. In the meantime, I sip plenty of espresso here at home. Italian Easter Cookies are the perfect accompaniment. Taralli are firm rather than crunchy, with a lightly sweet vanilla dough encased in crisp citrus icing. The icing is a mystery to me, another one of those baking moments when I wish I understood the chemistry better. The ingredients for this icing look like the typical ingredients for a simple confectioner’s sugar glaze, but something changes when those ingredients are gently warmed. The resulting icing is thicker, crunchier, and hardens VERY quickly, so quickly that I had a hard time getting the sprinkles to stick. I tried coating some of the Taralli with icing that had not been heated. The flavor was the same, but the crunch of the heated icing was better. 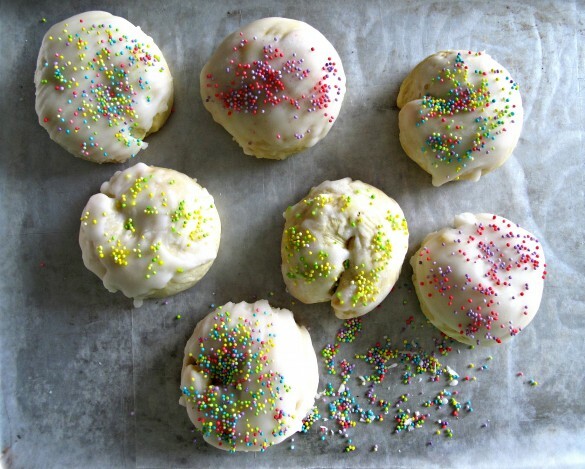 Italian Easter Cookies make a great care package cookie even when it isn’t Easter. They stay fresh for at least a week and travel well. Taralli are also great to fill the cookie jar at home and enjoy alongside a cup of coffee or a glass of milk. Melt butter in the microwave and set aside to cool slightly. In the bowl of an electric mixer, whisk the eggs then beat in the sugar. Mix in the melted butter and vanilla. Gradually add in the flour mixture to form a soft dough. Refrigerate the dough 1 hour- overnight, until firm enough to handle. When ready to bake, preheat oven to 350°F. Line a baking sheet with parchment paper. Divide dough into 32 even pieces ( about 46 grams/1.6 ounces each). Roll dough pieces into a ball, then into a 7” rope. Press the ends of the rope together to form a circle. Place dough rings on baking sheet 2"- 3” apart. These cookies expand while baking. Bake for 10-14 minutes, until puffed and just turning golden. To make the icing, stir confectioner’s sugar, water, and extract in a small saucepan, over low heat just until combined and barely warm. WARNING: This icing hardens VERY quickly and must be used immediately. The cookies and sprinkles should be ready to use before making the icing. It is helpful if one person can do the icing, while a second person quickly adds the nonpareil sprinkles before the icing hardens. Dip the cookie tops into the icing or use a pastry brush to coat the cookies with icing, and immediately add sprinkles. Once the icing in the saucepan hardens, do not try to reheat it. The sugar will crystallize and make a sandy icing. Wrap the cookies individually in plastic wrap and place in a ziplock bag or plastic storage container. If using a storage container, add crumples tissue paper between the cookie and the lid, if necessary, to prevent ANY movement while shipping. 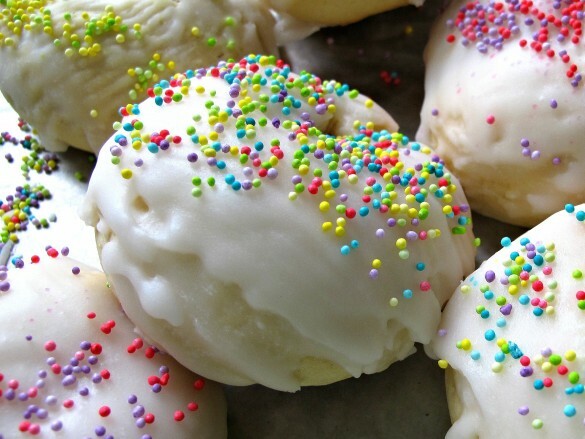 Readers who loved Italian Easter Cookies also loved these Italian cookies! Click on the photo for the recipe. Love learning something new…there are so many Italian cookies and desserts that I need to discover! These cookies look so pretty; I’d enjoy eating them and just looking at them in a cookie jar at my house. I’m also fascinated by the magic of heating up that icing. Yeah!!! – I signed up for email notification of new posts! Sorry I didn’t have the solution for you – I am lost with web design. Loved your story of traveling in Europe as a child – what a fantastic experience and sorry about the traveling sickness – that must have been difficult 🙁 And these cookies are fantastic! I bet they just melt in your mouth. Perfect with a cup of coffee. Guess I better go eat my lunch because I’m drooling now! Thanks, Tricia! It is a work in progress, but I am excited. I picked the design and the web person did the technical stuff. The bugs are still being worked out and I am dabbling/drowning in the world of plug-ins. 🙂 So much to learn! I really appreciate your enthusiastic endorsement! Oh my gosh what horrible timing to get sick! I got sick once as a kid while on a summer vacation – I still distinctly remember it! These cookies look absolutely fantastic – I have always wanted to go to Italy – it’s on my bucket list! I made these from the same book you mention and they came out great Takes a bit of time to make but worth every minute! Thanks, for taking the time to comment, Rosemary! I agree that the chilling time and shaping of the cookies takes more time than your average mix and drop cookie, but its easy to do, and as you said, worth every minute! Do you have other favorites from the Malgieri book that you recommend? these cookies have the same name as a recipe I have for an Italian boiled cookie that is baked after boiling. Did you skip a step by some chance? I have been looking for the boiled then baked cookie recipe since i first had one as a little gir when i watched our neighbor making those wonderful Frosted Easter cookies. Can you somehow share the recipe? Oh my goodness. Can you please share the recipe for the tarrelli that is BOILED before it is baked??? I have been looking for this boiled then baked tarrelli recipe for at least 25-years since a dear family friend made these when I was a young girl. Every time I think of these cookies I am brought back to that wonderful Easter. I hope you can share the recipe. Happy Easter. Thank you for the tarreli resource for the baked then boiled version. I look forward to trying them soon! You are welcome! Let me know how they turn out! Oh my goodness, love your new look Wendy! It looks fabulous! The cookies sound wonderful too and so pretty! I remember your story about the trip to Italy, definitely one you’ll never forget. I had a air flight like that too, makes us really appreciate feeling normal, doesn’t it? Thanks, Chris! I love the new look too! Its a lot like moving into a new house you are thrilled with but have to live there awhile to figure out the best way to arrange the furniture. 🙂 You are right about appreciating normal. A lesson in not taking ANYTHING for granted! WOW! Congrats on the switch! LOVE the new look! Very clean. Nicely done! Thanks, Lokness! I took the leap to self-hosted and am a bit overwhelmed. Lots to learn! 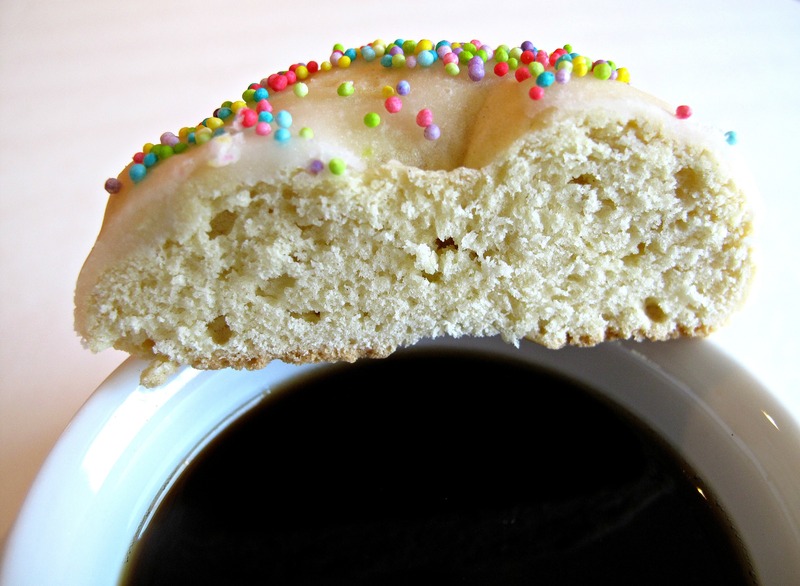 A good cookie for dunking in coffee is a wonderful thing! These Taralli cookies will be made often at my house! 🙂 I hope you have a lovely Easter! I’m pinning this recipe for later! These look delicious. I think one of my grandmas used to make these for us when we were kids. Thanks, Theresa! Oh, I hope they live up to your memories of the cookies your grandmother made! Nostalgia food is the best! My grandma used to make these so seeing them brings back wonderful memories. 🙂 Pinned to make! Your Italian Easter Cookies are fantastic, I just featured them on my Face Book page! Thanks so much for sharing with Full Plate Thursday and come back soon! These look so yummy! I really want to make these. What a cool experience traveling Europe as a kid. Too bad about the bug on your return trip! Hopefully next time will be a culinary adventure. I’ll have to make a batch of these and invite my grandma over for coffee. She is the queen dunker and would looove these! Thanks for sharing at Throwback Thursday! Thanks, Carlee! The years in Europe were a big influence on my life and my wanderlust! 🙂 I hope you and your grandma have a fabulous tea party with these! I hope you get your return trip some day! What a bummer to be surrounded by so much food and not be able to eat. I have a friend that live in Italy for a few years and he still raves about the food. I will have to try thee cookies, they look amazing! Thanks for sharing! I am 100% Italian and have been to Italy but don’t remember ever having these cookies. They are just the kind of love to have with coffee. And I love that I can add them to my list of other Italian cookies I make every Christmas. Thanks for the recipe! These look so delicious! Pinning it! I’m so sorry you were ill on your trip. There’s nothing like being ill on a plane. Although we fly a lot, it’s only happened to me once and luckily I was not as ill as you were! 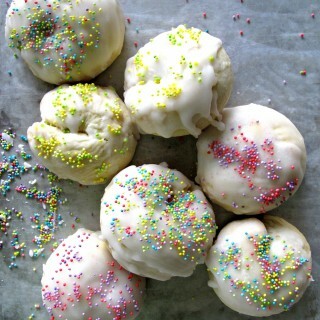 Your Italian Easter Cookies look so pretty and sound so good. They remind me very much of cookies I’ve had in Italy and I hope to make some for this weekend! Pinning and sharing. Thank you so much for being a part of Hearth and Soul, Wendy. Thanks, April! I definitely need a do-over on that trip! I was SO thankful that the worst part was over shortly after we landed and that I was able to do so many of the things my son and I had planned. There can never be enough trips to Italy! These cookies look amazing. They remind me of ones my friend’s mother use to make. I wanted to let you know that you are my feature at Wonderful Wednesday Blog Hop that will open at 7 tonight. I will take a dozen to go please! These look amazing! Gotta love Italian pastries. Thanks, Susan! So many different Italian cookies are great for care packages! How fun these little cookies are! Thanks for sharing them on Funtastic Friday! I haven’t seen any of these since all of my Italian Aunts were living and making cookies at the holidays! I need to start the tradition up again. 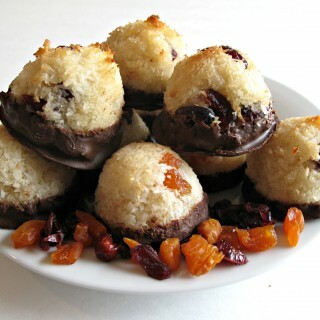 Thanks for sharing your recipe at the Family Joy Blog Link Party this week! I hope you’ll try these and that they will bring you happy memories. Cookie traditions are the best kind! Thanks for hosting the Family Joy Blog Link Party! The cookies sound amazing!!! You always have such clever tricks with the icing. CAn the icing be re-heated a bit if Im not fast enough wih dipping? Thanks, Karren! I am not sure about reheating the icing, because I haven’t tried it. I was not rushing when I dipped these cookies, and the icing was a perfect consistency until the last 2 or 3 cookies, so I didn’t bother trying to reheat. The heat should remelt the sugar, so my guess is that reheating would work, if needed. 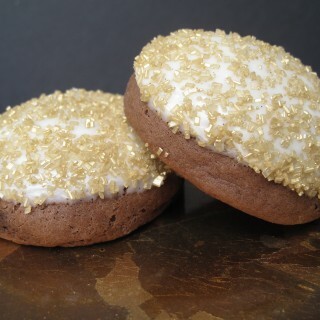 Thank you for featuring these cookies on #OMHGFF! 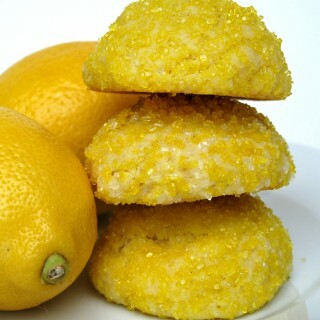 Question: for the Italian Easter cookies should there be lemon extract in the cookie dough also? I’ve read a few different recipes for the cookies and they all ha e lemon in with the cookie dough too? Just wondering because I made a batch with out the lemon extract and hope I did t mess up the cookies. Oh my oh my! I am embarrassed to say that I am 100% Italian and have not heard of these cookies! I printed the recipe and am making them asap. I have my grandmothers biscotti and fig cookie recipe, I make Italian meatball cookies too so I am excited to add these to my recipe file. Thanks for sharing! Not only are these pretty, they look really tasty! Thanks for sharing at the What’s for Dinner party. These would be right at home on our Easter table. They are so pretty to boot. Now we just need to get you another trip to Italy planned…. feel free to take me along! I’m so sorry you were not well on your trip to Rome – that’s just not fair when there’s so many lovely things to eat! These are beautiful cookies, that is for sure. They look pretty much irresistible, Wendy! Sharing on the Hearth and Soul Facebook page. Hope to see you at the party this week! These look so tasty! I used to eat these in my childhood from a local bakery! Featuring you as part of Thursday Favorite Things! Thanks, Angelina! I hope these live up to your delicious childhood cookie memories! 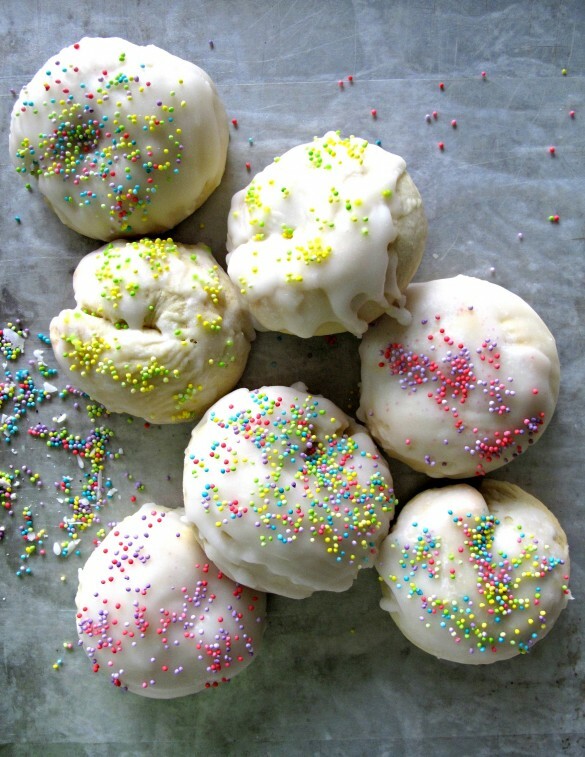 Thank you for featuring the Italian Easter Cookies! Your Italian cookies look amazing!! I grew up eating these and they are my favorite cookie. (Even better than chocolate chip cookies!) My mom’s paternal grandparents were born in Italy and my great grandmother used to make them. My grandfather learned how to make them so the tradition continued. No one thought to get the recipe. I cannot wait to try these out. Maybe for Christmas. Oh, Robbie, I sure hope these cookies can at least come close to your grandmother’s! Why don’t we think of the important questions until there is no one to answer them?! Please let me know how these compare when you try them. I will keep my fingers crossed!